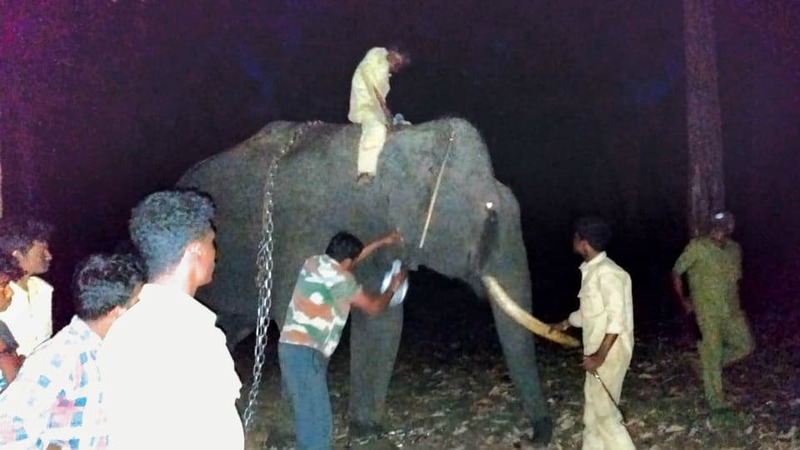 2018-12-07: Elephant Ashoka, which had gone missing about two weeks ago, was traced at Kaimara Forest Beat in Balle Range in Nagarahole Reserve Forest on Wednesday night. Ashoka is now housed at Balle Elephant Camp. Ashoka, was let out for grazing and he had not returned. The Forest officials, along with mahouts and kavadies, launched a search operation to trace Ashoka based on the marks created on the ground by the chains tied around his legs and finally traced Ashoka deep inside the forest at Kaimara Forest Beat. It is learnt that, Ashoka, who belonged to Mathigodu Elephant Camp was brought to Antharasanthe for the tiger combing operation and was housed in Balle Camp.